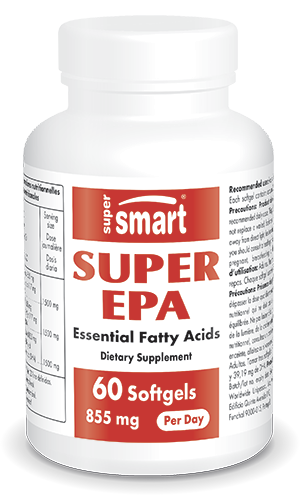 Our dietary supplement Super EPA has been formulated with optimal strength eicosapentaenoic acid, more commonly-known as EPA. Along with docosahexaenoic acid (DHA), EPA is one of the two best-known omega 3 fatty acids, and like its counterpart, is recognised as offering numerous benefits for health. Indeed, while some fatty acids are implicated in the development of disease, omega 3 are considered ‘good fats’ - the body needs them in order to function properly. Obtaining omega 3 from the diet is essential as EPA and DHA cannot be produced by the body, and while certain food sources of omega 3 do provide an intake of EPA and DHA, it is often inadequate. With its high EPA content, our Super EPA product has thus been developed to offer a natural and optimal omega 3 fish oil supplement. Like all omega 3 fatty acids, EPA participates in many functions in the body. It increases fluidity in cell membranes and thus plays a key role in many bio-energetic reactions. In addition, EPA has been extensively studied for its beneficial effect on vascular physiology. Scientists believe it helps protect the cardiovascular system. In particular, it acts as a precursor to prostaglandin-3, a molecule that affects blood fluidity. EPA’s activity also appears to make statins more effective against heart problems such as coronary heart disease. In addition to its preventive and therapeutic role in cardiovascular disease, EPA is currently being investigated for its anti-inflammatory and anti-allergy properties. they reduce the heart rate and blood pressure and are thus beneficial for patients with arterial hypertension. In keeping with our commitment to quality, our Super EPA product has been formulated from a first-class fish oil. The fish selected for its manufacture are from species naturally rich in omega 3 fatty acids, such as sardines, mackerel and anchovies, obtained from fishing zones free from any industrial contamination off the coasts of Peru and Chile. These are sustainable fisheries that meet strict criteria, with guaranteed management of fishing quotas. The oils used in our Super EPA product are therefore certified Friend of the Sea®. Super EPA’s formulation capitalises on the latest advances in purification and delivery methods to offer the best possible omega 3 supplement. Using patented purification technology, we are able to produce a high quality supplement, free from any contaminants (PCBs, heavy metals, dioxins). This innovative procedure also means our product offers a beneficial intake of omega 3 due to its high content in EPA. Each capsule contains 285mg of EPA and 39.19mg of DHA, and three capsules a day is the dosage recommended in order to obtain the benefits of omega 3. This dosage can be adjusted in line with your needs and the advice of your therapist. For meeting your daily requirements in omega 3, you may also be interested in other supplements in our catalogue: Super DHA and Super Omega 3.